The original version of this article, by Nick Snow, appeared in the Oil and Gas Journal. Increasingly disruptive protests are likely if oil, gas, and mining companies and national governments don’t pay closer attention to indigenous populations’ needs as Western Amazon basin resources are developed, an expert warned. “They usually are ignited by past grievances that have not been resolved,” said Patricia I. Vasquez, an independent analyst who previously was a Jennings Randolph Senior Fellow at the US Institute for Peace, at a March 21 launch of her new book, Oil Sparks in the Amazon: Local Conflicts, Indigenous Populations, and Natural Resources. In her book, Vasquez said she examined 55 such conflicts in Peru, Ecuador, and Colombia from 2004 through 2011 when a period of high crude oil prices and strong demand brought investors to an area previously considered to be economically marginal. Continue reading in the Oil and Gas Journal. 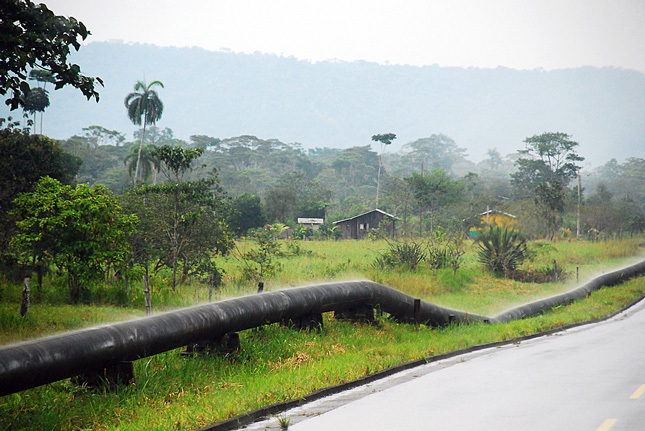 Photo Credit: A portion of the Oleoducto de Crudos Pesados pipeline, courtesy of flickr user guenno.